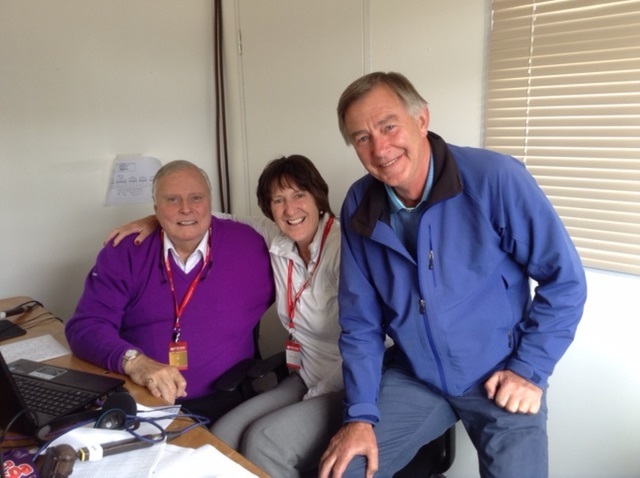 Firstly, I must start this week’s blog with belated birthday greetings to Peter Alliss, the most entertaining, informative and articulate broadcaster with whom I’ve ever worked. We all raised a glass of something nice to you out here in South Africa, Peter. Looking forward to seeing you during the season. With the birthday boy and Ken Brown. 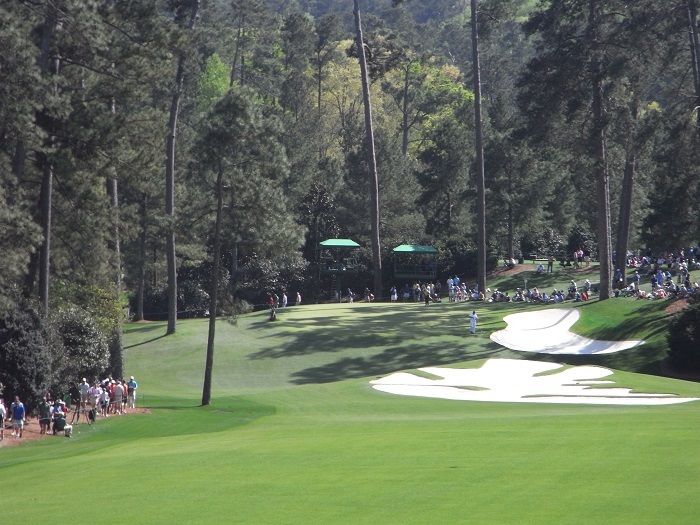 So here we are in March…….. and that means that NEXT MONTH the Masters will be rolling round again. 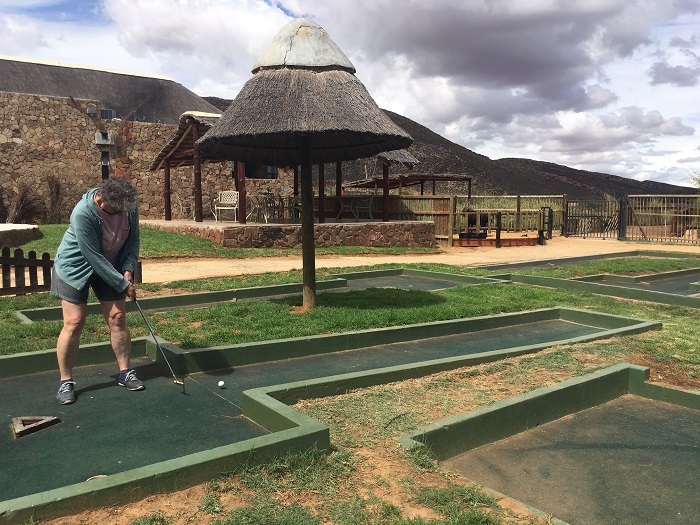 Having being hors de combat for more than half of the almost five weeks I’ve been here in South Africa (old back injury), I’ve had plenty of opportunity to ruminate on the sofa while indulging in a surfeit of Six Nations rugby and golf watching. 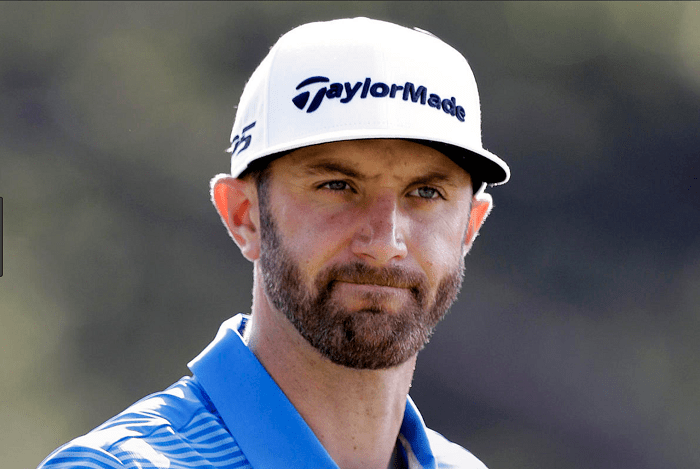 Dustin Johnson has just swept the field aside in the World Golf Championship event in Mexico with no more difficulty or effort, it seems, than if he were swatting a troublesome fly. He gets a few weeks a year when he is simply unplayable and no one can live with him. He’s now back to second in the world rankings, a smidgeon behind Justin Rose and thoughts of the Masters are bubbling to the surface of all the players’ minds. But brilliant as he is, how can DJ ensure he peaks at exactly the right time for the first major of the year? This fickle, will o’ the wisp sport refuses to be mastered for anything other than fleeting moments, if at all. Remember last year? Johnson was world No 1 and playing the best golf of his life. He had won three straight PGA Tour events going in to the Masters and was odds-on favourite to add to his, so far, paltry haul of one major title. Then, on the Wednesday evening, he slipped on the stairs in his house, landing on his lower back – and that was that. He withdrew moments before his Thursday afternoon tee time. His almost perfect preparation ruined in the blink of an eye. So, I wonder what he’s thinking now? Is he setting out to complete what he started last year or will there be an uncomfortable, niggling feeling at the back of his mind that perhaps, with six weeks to go, he has peaked too early? Runner-up in Mexico was Rory McIlroy. The Ulsterman, now living in the States and committing to play most of his golf there, is almost five years removed from his last major win, the 2014 Open Championship. That major drought was unthinkable back then for the multi-talented young man with the jaunty swagger and all the shots. There were fleeting thoughts that here may be the player to challenge Tiger’s haul of majors. 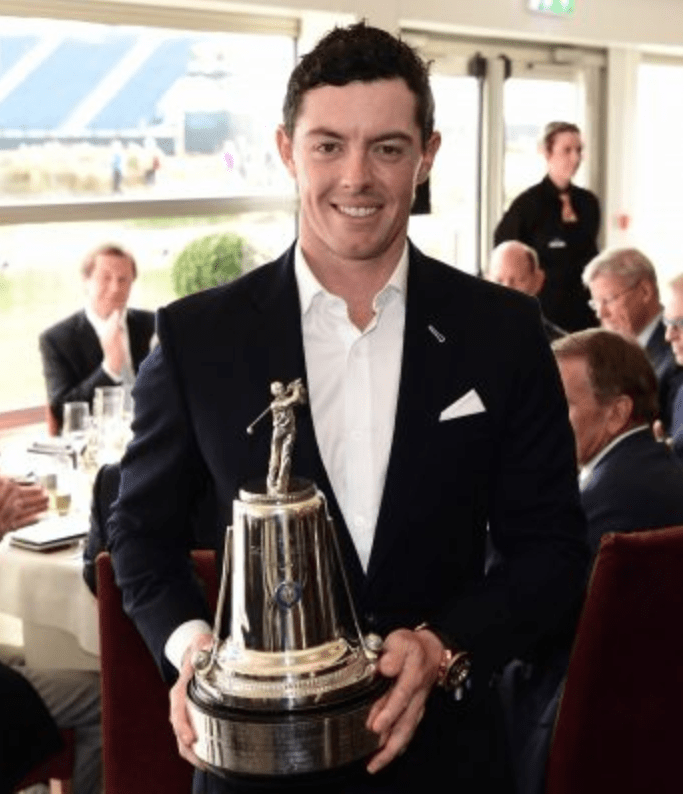 Rory – nice jacket, wrong colour. The Masters has assumed monumental importance for Rory. It is the missing piece in his quest to join Gene Sarazen, Ben Hogan, Gary Player, Jack Nicklaus and Tiger Woods, owners of the Career Grand Slam. They are the only men to have won all four of golf’s modern majors at any time during their careers. That is a very, very elite club. This will be Rory’s fifth go at completing his own CGS, his fifth time at having the spotlight on him regardless of current form and yet again the endless discussions will take place about his collapse in 2011 when he squandered a four-shot lead with nine holes to go. We will hear how the course suits his game and his high ball flight, but how the greens will expose the relative weaknesses in his putting. And until he finally does slip on that green jacket he will continue to endure the longest, slowest, inexorable build-up to any major. Beginning this year, the Open Championship becomes the final of the big four to be played – meaning a nine-month lead in to Augusta each year. Can Rory go inside to that place from which peak performance springs and deliver his heart’s desire? Augusta is a known opponent. It is the only major played each year on the same course and although its current length makes it a bombers’ paradise it also has the most exacting short game examination imaginable. Most players know their own weaknesses and at the time of year when thoughts turn to Magnolia Lane the golfing demons can grow and multiply in your mind if you’re not careful. Augusta National, beautiful and brutal. Watch the players carefully in these last six weeks before the 2019 majors commence. Watch Justin Thomas. He coughed up a 54-hole lead the other week in the Genesis Open and was out of sorts with himself for the first couple of rounds in Mexico, describing himself as “irritable”. He turned that irritability into a closing 62. Justin Rose, a master of preparation, peaked perfectly to win the gold medal at the Rio Olympics. He is scheduling meticulously to ensure the balance between rest and competition. And what about Jordan Spieth. He’s endured putting woes and long game trials, but of all the modern players he seems to hold the key to the secrets of the Augusta National golf course. Champion in 2015, tied second a year later, he fell to a lowly tied 11th the following year before giving the leaders a fright last April with a rampaging closing 64 which saw him finish third. Some of the players are hoping they have the mentality for the examination, the guile required to taste victory. Spieth knows he has. Dyed Gayle Dewi Sant. Happy St David’s Day. Or, more correctly, after a prolonged tussle with my thinks-it-knows-it-all computer, Dydd Gwyl Dewi Sant. Also, to a friend who is Irish but is deemed Welsh by insertion, being married to a man from some valley or other: Penblywydd Hapus. Happy Birthday. Someone suggested I should dedicate this blog to golf for a change but that’s a bit tricky because there hasn’t been any golf on my South African agenda this past week and the dodgy internet connection here in Franschhoek has served to confirm that there’s nothing remotely Zen-like about my tolerance levels. The odd headline about the Open being endangered by Brexit or players being cleared of wrongdoing titillates but when the body of the story still hasn’t downloaded after 20 minutes…..Polite words fail me. In my defence, a saint’s tolerance would be strained by having to live with a Liverpool fanatic and a Manchester United diehard after Wednesday night’s results. Smug, patronising, condescending, I got the lot – and it wasn’t my imagination. “Don’t worry. You’ll still finish third,” one of them said, unkindly. Now, I don’t really, really care about football that much these days but as Spurs, who have had us fans daring to dream for a season or two, start to falter once again at the wrong time, I admit it, I cracked. I threw a terrible twos type Totspurs Temper Tantrum. It was unedifying but strangely satisfying and, fortunately, there was nothing to kick. The resident squirrel was too fast and the nearest congress of baboons too far up the mountain – and far too dangerous to consider debating with. 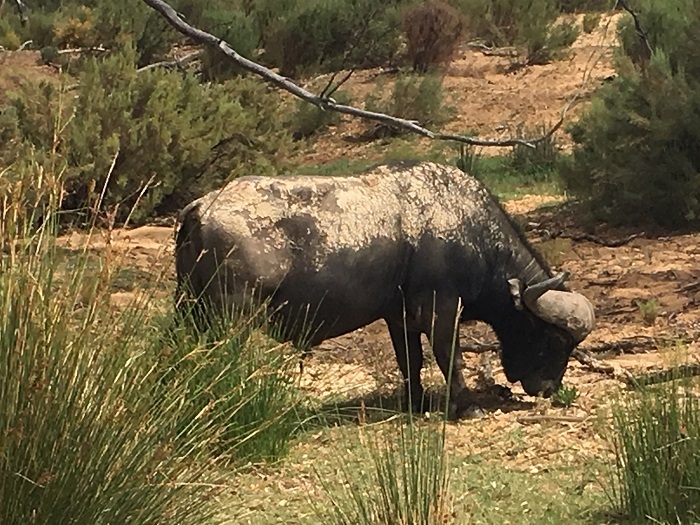 A water buffalo, the most bad-tempered and unpredictable member of the Big Five (buffalo, rhino, elephant, lion and leopard). Anyway, football bloody hell paled into insignificance in the face of yet more stunning South African experiences. Even being stuck in roadworks on the way in to Cape Town is not so bad when you’ve got a great view of Table Mountain; and there’s no complaint about the traffic when you can park next to an uncrowded beach with views of Lion’s Head and the little dot that is the cable car carrying people to the top of the mountain. Every time you turn a corner there’s another glorious view and endless, endless mountains. One of our Uber drivers, a Zimbabwean, was less enraptured than we were: “Too many mountains here,” he said and I suspect he hadn’t seen the half of it. This is the country that put the gorge into gorgeous and it must be a geologist’s paradise. 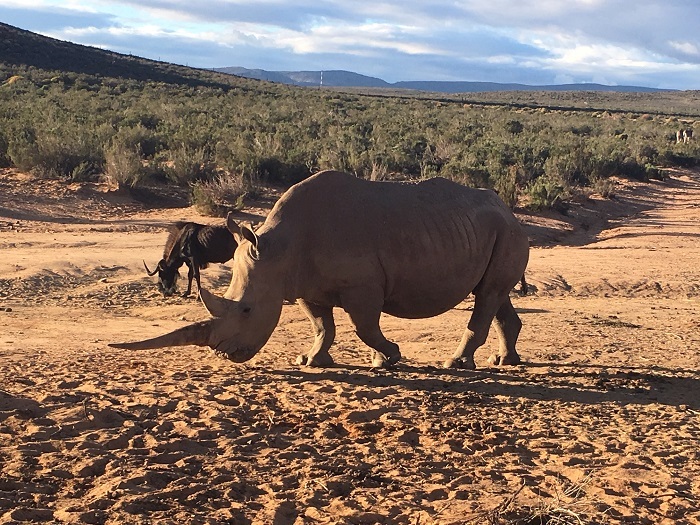 We drove two hours east of here, into the beginnings of the Karoo, to spend a couple of nights at Aquila, a private game reserve, a safari light if you will, a good place for beginners, geared up to introduce us to a bit of wild Africa. There was a bit of the conveyor belt about it but while the patter was much the same each time, every drive was different. A rhino quite content to ignore us but the driver of our lorry was always watchful. No room for complacency with 3 1/2 tons of wildlife. That’s a gnu in the background. First time out we got so close to an elephant that you could see every fold, every wrinkle in its skin. The rhino, even the ones with babies, seemed supremely indifferent to us, so there was no need for a super long lens to get your happy snaps. The hippo, who do most things under water, generally kept a low profile, apart from one male who put on a performance that had the parents with children on board grateful that his partner remained totally submerged. They can hold their breath for six minutes apparently and that was more than long enough. We saw zebra – a group is called a dazzle and they did; giraffe, the Southern version with shortish necks because they have to work with bushes rather than trees; lion, who lolled about for photos on the first afternoon, then were nowhere to be seen the next morning; several sorts of antelope, including the delicate, beautifully marked springbok; and ostriches. Oh, and Georgie the crocodile, who was hand-reared and is being prepared for her introduction into the wild. We saw no snakes but today we’re going to watch the WSB Cape Cobras take on the Multiply Titans in a day/night match at Newlands Cricket Ground. It’s not far from the Kirstenbosch National Botanical Garden, where the Cape Town Philharmonic perform on Sunday evenings during the summer and we listened to Mozart and Beethoven with Table Mountain towering over us. Magical. What about the golf? Ah yes. Well, there was mini golf at Aquila, geared towards the minis because it was in the children’s play area but the balls, though not entirely round, were hard and I had to sign them out and then back in. Desperately seeking a putting stroke under African skies. It’s not usually my job to do the tips around here but since I’m keen on recycling and my friends and family, with more than a hint of sarcasm, call me the eco-warrior, I’ve decided to match Mo’s tip with one of my own: plastic bottles are not trash. That’s the slogan on the side of the collection skip at the local tip, which we’ve been visiting regularly, depositing bags of plastic, including bottles and lots and lots of bottles of the glass variety, an inevitable consequence of a load of wine drinkers visiting an area awash with vineyards, cellar doors and wine shops selling at cellar door prices. If people are going to put all that hard work and expertise into producing something delicious, it would be rude for a visitor not to have a taste. We were directed to our particular tip by a woman at the Saturday market who helps local women make a living from old plastic bags. The women crochet them into baskets of all shapes and sizes and it’s hard to believe that the lovely stuff they produce started out as rubbish. 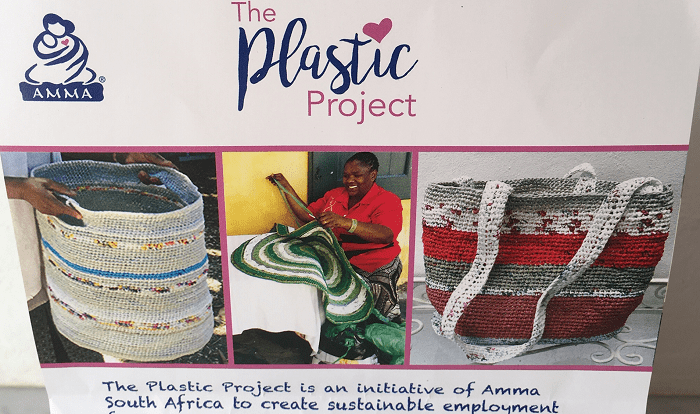 The Plastic Project aims to transform trash into treasure, gives the women an income and any excess goes towards a feeding programme for disadvantaged children. The Plastic Project makes good use of all those carrier bags we used to throw away willy-nilly. One of the things I love is how endlessly creative people are here, with artists and crafters making use of anything and everything that comes to hand. You’ll find bracelets and earrings (no, I haven’t added to my collection yet) made from safety pins; marvellous, multi-coloured heads of rhino, elephant and kudu made from drinks cans; place mats made from old crisps packets; giraffes made from papier-mâché and painted in gaudy colours; not forgetting the amazing jewellery made from little pieces of ostrich egg, painstaking work to the outside eye. We had a road trip before this week’s golf and headed east for a couple of days, along part of the Garden Route. We stayed at the very different towns of Oudtshoorn and Knysna, getting some idea of just how vast and varied the country is but always with mountains, mountains everywhere. We passed through George, Ernie Els territory and saw the signs to the fabled Fancourt and to George GC, one of the oldest courses in the country. There was no room for golf clubs on this jaunt but we had brought our bathers and had a dip in the Indian Ocean at Victoria Bay on the stunning (that word again) coastline just south of George. On the way home we made a stop at Mossel Bay, where everyone assumed we’d come off one of the cruise ships. How could they have known that Mo would rather walk the length of Africa than spend time on a boat, no matter how grand and stable? It’s all she can do to get on the Holyhead to Dublin ferry and she will NEVER, EVER, EVER set foot on the Scillonian again, having had to take it from Penzance to the Isles of Scilly because it was too foggy to fly from Land’s End. Anyway, back to the golf. We did see a sign to Mossel Bay GC, whose most famous son is Louis Oosthuizen, Open champion in 2010. He’s also been runner-up in all four major championships, perhaps not the Grand Slam he’d dreamed of but quite a feat nonetheless. We gave a wave and carried on. 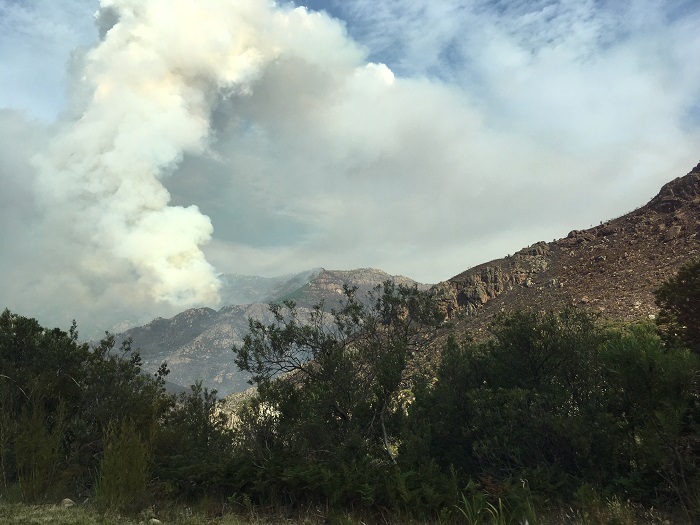 We hadn’t been watching any television or listening to the radio, so we were shocked to see charred bush and lots of smoke as we approached the Franschhoek Pass, a few spectacular miles from our digs. The smoke from the forest fires in the hills above Franschhoek. They’ve been burning for several days now. There were helicopters trying to douse the flames and fire fighters trying to cope with difficult terrain and fires that were hard to get at. Families of frightened baboons gathered at the side of the road and a couple of the babies were lucky to dive out of the way of a truck negotiating the bends at speed. The driver gave a blast on his horn and the baboons all survived that encounter at least. The heat and the wind have made it difficult to control the fires and there’s a red halo around the peaks at night. So far, in the town, life goes on, albeit with a wary eye towards the hills and the smell of smoke in our nostrils. 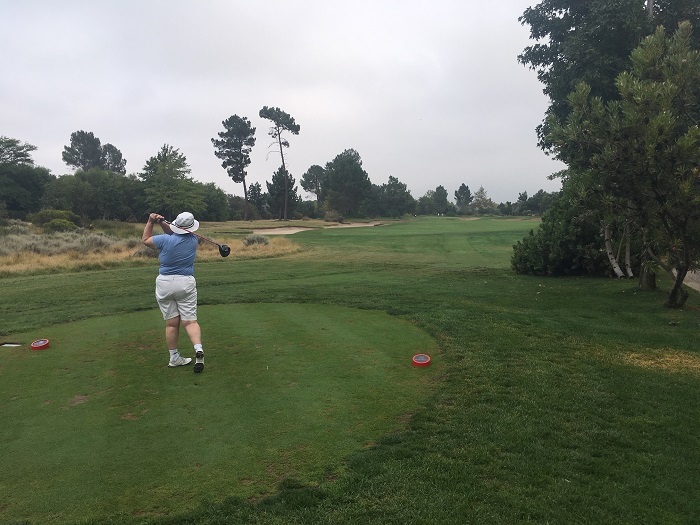 Golf of the week was at Pearl Valley, where one of our number was making her debut. Mo was hors de combat because of her back and Gillian took the money with a spectacular birdie three at the 8th, our 17th hole. A warning to all those looking to take her on at Castle Stuart this summer – make sure you get plenty of shots. We were just sorry that Geoffrey Boycott, whom we’d bumped into at the halfway house and who had given us the benefit of his advice, was not there to see the coup de grace. Pam playing her first shot at Pearl Valley on a cool morning. 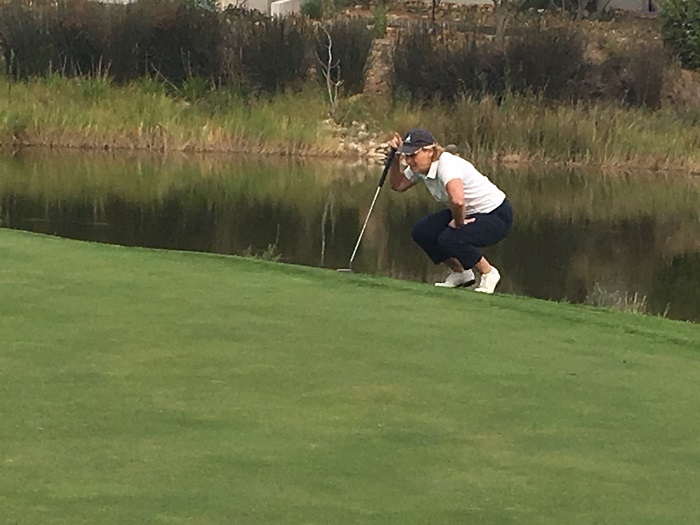 Gill, eagle-eyed, lining up a putt at picturesque Pearl Valley. Not having played in a proper golf tournament for at least a couple of decades means that I have not had the need to crack the spine of the Rules of Golf with any great intent for ten years and more. In the last week, however, that has changed hugely – not because I’m going to join the Seniors’ Tour – but because of the introduction of the New Rules. I had familiarising myself with the NRs down as one of my December jobs but, alas, other stuff seemed to get in the way and I was pretty much unaware of many of the nuances until last Monday. 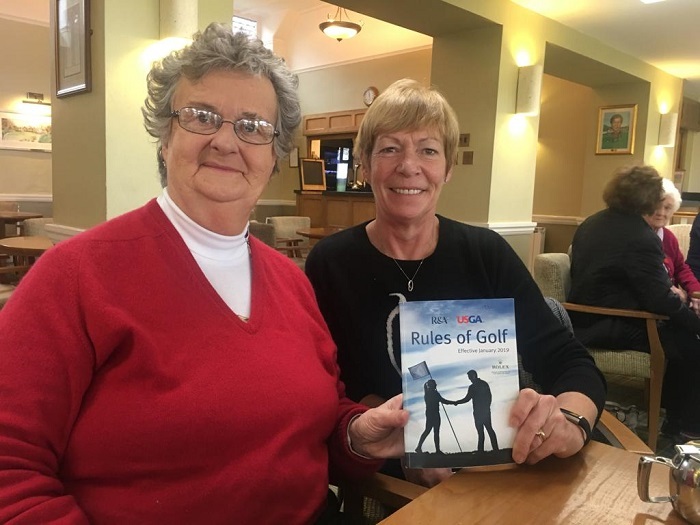 Hosts of clubs up and down the country are holding Rules get-togethers to help folk understand just what has changed and to aid the members in getting to grips with new terminology and procedures. At Delamere Forest the dubious honour of guiding the women members through this fell to Ruth Whitehead and Jackie Roper. The hours of reading and preparation they had done so the rest of us wouldn’t have to was immense and they did a great job with a power point presentation, numerous hand-outs and off-the-cuff (and often hilarious) demonstrations. Ruth and Jackie, rules gurus, but more importantly, great club members. Apparently there are now 24 rules, all designed to fulfill the stated aim of making golf Faster, Fairer, Simpler, (FFS for short). That’s a noble aim but I wonder if the powers-that-be have left any room for further tweaking, if required, at a later date? I ask this with particular reference to the new way to drop a ball, which seems to be the most discussed and most practised of the NRs. Patricia’s slight knees-bend which she was pondering in last week’s blog is, I understand, a no-no – or at least a careful-careful. The rule requires the player to drop from knee height and knee height is the height of a player’s knee when in a standing position, so I suppose you could bend your knees as long as you drop the ball from slightly higher than said bent knee? This drop gets a thumbs up for accuracy, but not for speeding up play, methinks. And if you don’t want to get your trousers dirty and put a towel down……is that allowed? Or is it building a stance? Oh dear…..! Does this drop really deserve the thumbs down? Yes, Anne is on her hunkers, but she’s dropping the ball from slightly higher up. Is this OK? Answers please……..
And what about dropping when standing on a severe slope? Is the drop from knee height where the player is standing or where it would be were you standing right on the spot where the ball is to be dropped? Hmm! I now understand better the herculean and complicated task of trying to simplify something. And, of course, joking aside, the physical difficulty of dropping from knee height with straight legs is not to be underestimated. Having undergone back surgery 30-plus years ago I have been consistently exhorted by health practitioners of all persuasions ALWAYS to bend my knees. So, another dilemma arising from a seemingly straightforward change in the rules. This may be correct under the new rules, but it’s a potential back tweaker. Have your physio on speed dial! All in all, the FFS aims of the ruling bodies are admirable and, it seems to me, will be largely successful. The current chat and general interest stimulated by the rules changes have brought clubs and players together in their collective desire to get their heads around the changes. I do hope there is room for some slight alterations. For instance, I’d just change the dropping height of a ball to “from anywhere between knee and shoulder”. One final point. As long as I’ve played the game we have done our measuring on the course in the currency of number of clublengths and this has always struck me as odd as we all play with different lengths of clubs. Why do we not have a standard measure? Then every player gets the same distance in terms of relief, which strikes me as eminently more fair. It’s very easy to have a light alignment-stick style measure in your bag for the purpose. That surely would fulfill one of the stated aims – to be fairer? Just a thought.